September 12, 2018 – C-SPAN’s state-of-the-art 45-foot customized motor coach will visit the Chicago area on September 13 and 14. 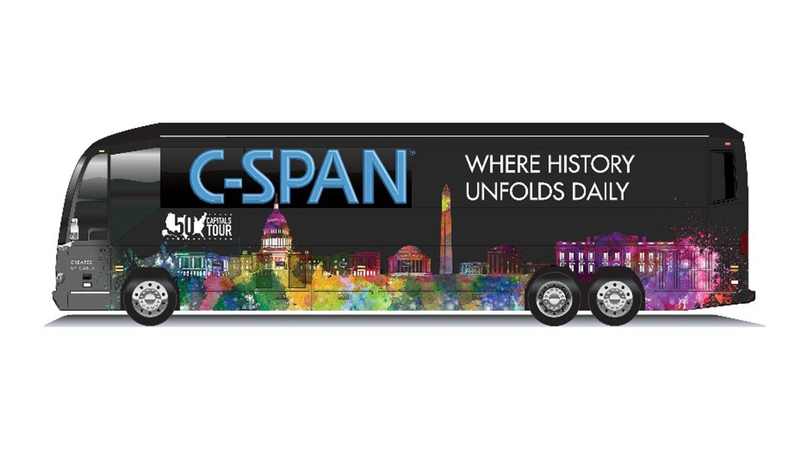 Partnering with Comcast to engage teachers and students, community members and elected officials through interactive demonstrations of C-SPAN’s multi-platform public service resources, the C-SPAN Bus will welcome visitors around the Chicago area. This visit is part of C-SPAN’s “50 Capitals Tour,” which includes stops in Springfield and other cities/towns across Illinois. Students and teachers are invited aboard the bus to learn about C-SPAN Classroom, a free online educational resource, and C-SPAN’s extensive online Video Library. With more than 235,000 hours of public affairs content, the C-SPAN Video Library serves a great educational source and research tool. To launch its newly built bus, C-SPAN embarked on a “50 Capitals Tour” in September 2017 and is heading to every U.S. state capital, culminating in November 2018 for the 25th anniversary of the Bus program. Throughout this 14-month tour, the C-SPAN Bus will open its doors at each state capitol to welcome visitors and interview elected officials during C-SPAN’s signature morning call-in program, Washington Journal. C-SPAN Representatives will also gather video responses from visitors as part of its “Voices from the States” – an opportunity for visitors to share viewpoints on state issues and what they think Washington leaders should do to address local concerns. Since 1993, a C-SPAN Bus has traveled across the nation in partnership with C-SPAN’s cable and satellite providers for local interactions through visits to schools and community events. Visitors to the bus will engage with the C-SPAN Bus crew and the onboard interactive tools to learn about the unique public service television network, C-SPAN’s online presence and C-SPAN Classroom’s comprehensive educational resources. Bus visitors will learn about C-SPAN’s unique non-commercial, editorially-balanced, non-biased coverage of public affairs and political events and the cable industry’s commitment to funding its operations. In the Chicago area, C-SPAN programming is provided by Comcast as a commercial-free public service and can be seen on channel 244; C-SPAN2 on channel 104; and C-SPAN3 on channel 105 and on the web at https://comca.st/2CLKjsZ. All funding for C-SPAN operations, including Bus visits, is provided by cable and satellite providers. Media can access photos and videos of the new C-SPAN Bus online here for reporting purposes. Fans can follow the adventures of the C-SPAN Bus on Twitter and Instagram @cspanbus and online at https://comca.st/2CQ9zyg. Created by the cable TV industry and now in nearly 100 million TV households, C‐SPAN programs three public affairs television networks; C‐SPAN Radio, heard in Washington D.C., at 90.1 FM and available as an App; and https://comca.st/2CLKjsZ, a video‐rich website offering live coverage of government events and access to the vast archive of C‐SPAN programming. C-SPAN established the C-SPAN Bus community outreach program on Nov. 2, 1993. 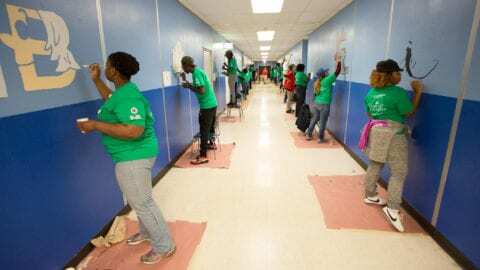 Comcast Corporation (Nasdaq: CMCSA) is a global media and technology company with two primary businesses, Comcast Cable and NBCUniversal. 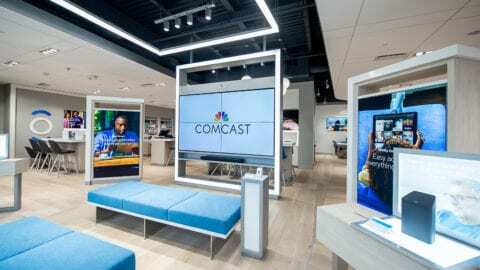 Comcast Cable is one of the nation’s largest video, high-speed internet, and phone providers to residential customers under the XFINITY brand, and also provides these services to businesses. 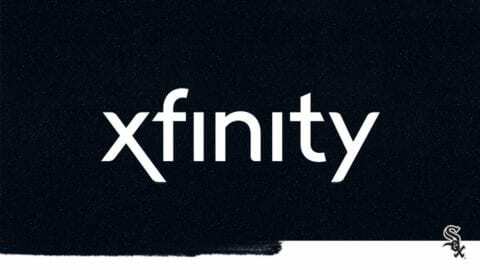 It also provides wireless and security and automation services to residential customers under the XFINITY brand. NBCUniversal operates news, entertainment and sports cable networks, the NBC and Telemundo broadcast networks, television production operations, television station groups, Universal Pictures and Universal Parks and Resorts. Visit https://comca.st/2CNmQI0 for more information.